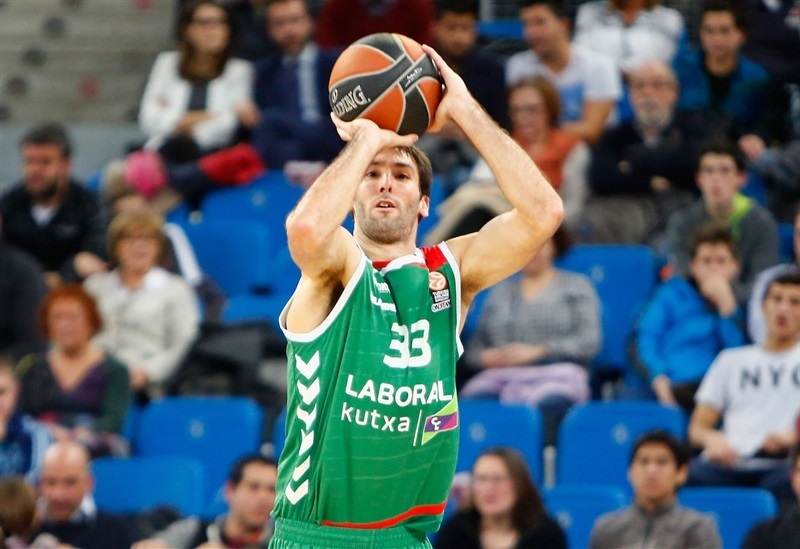 In a clash of Top 16-bound teams, Laboral Kutxa Vitoria Gasteiz remained perfect on its home floor by topping Cedevita Zagreb 92-70 on Thursday for its 200th win. Laboral became the sixth team to rush that milestone and finished the regular season with a 6-4 record. 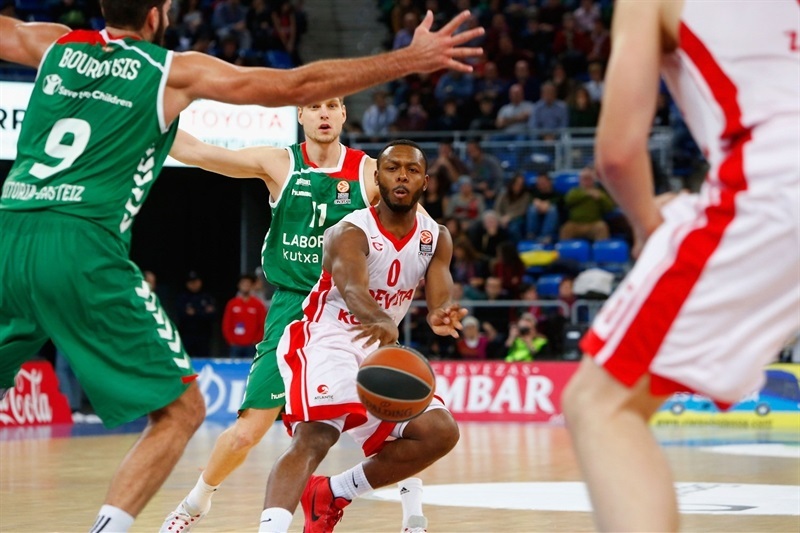 It will be second in Group B if Olympiacos Piraeus beats Anadolu Efes Istanbul on Friday. Laboral will be third if Efes wins, while Cedevita moves on to the Top 16 from fourth place with a 4-6 record. 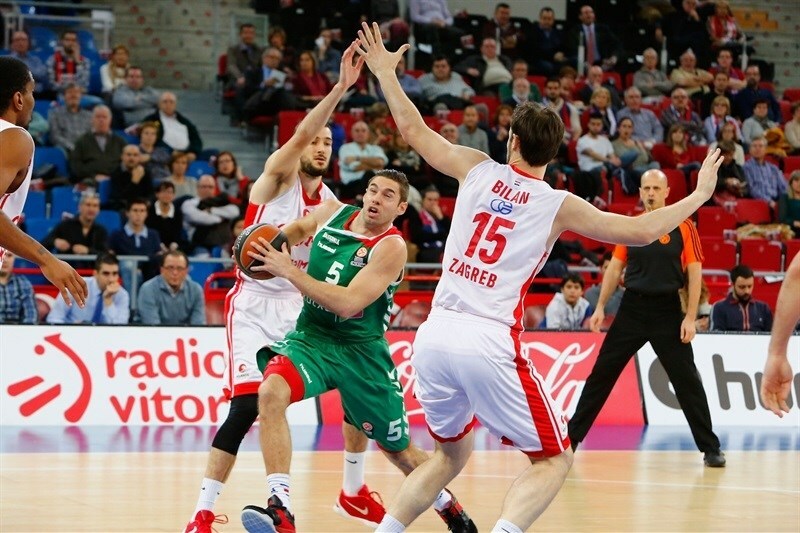 Fabien Causeur made sure Laboral took control of the game early, scoring 12 first-quarter points before Ioannis Bourousis and Tornike Shengelia helped open a 45-29 halftime lead. Marko Arapovic and Luka Babic led Cedevita back in the third, but the hosts opened the fourth with a 7-0 run before Bourousis hit a pair of triples that broke the game wide open. 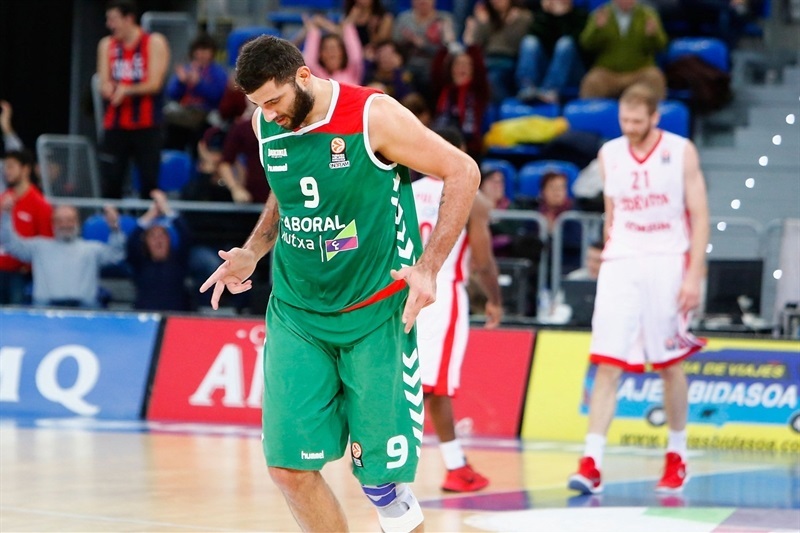 Causeur had 20 points, and Bourousis scored 14 points of his 17 points in late third and early fourth quarter. Shengelia netted 16 on 4-for-5 three-point shooting in victory. 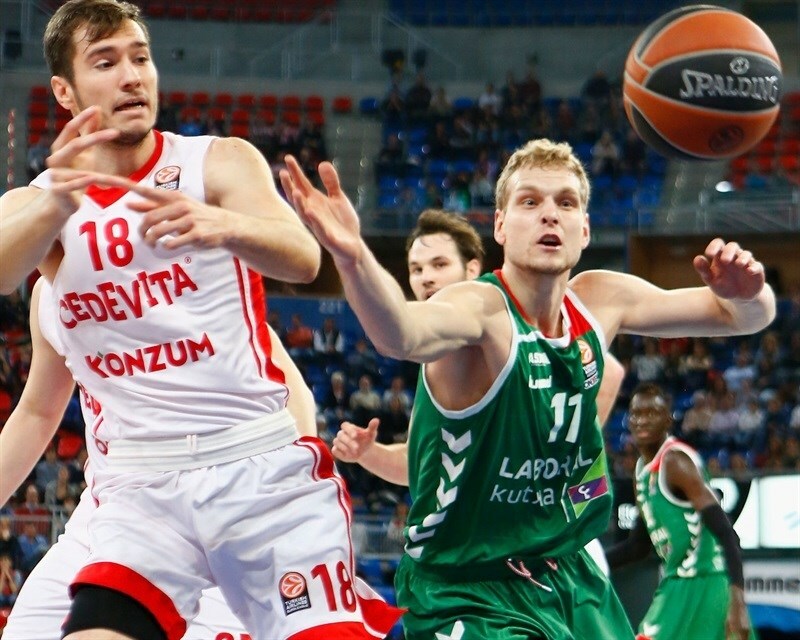 Marko Arapovic scored 12, and Miro Bilan collected 10 points plus 6 rebounds for Cedevita. Babic had 9 in the losing effort. Causeur got Laboral going, making a floater and a reverse layup. After Miro Bilan opened Cedevita’s account with a baseline shot, Causeur's triple made it 7-2 after exactly two minutes. But Karlo Zganec made a short jumper, and Jacob Pullen added a runner and a triple during a 0-9 run that gave the visitors a 7-11 edge. Darius Adams’s three-pointer ended the run, before Adam Hanga and Kim Tillie scored from close range. Causeur and Nemanja Gordic traded baskets, before Bourousis stepped up. The big man first found Hanga for a dunk, then dished it for a Causeur layup. 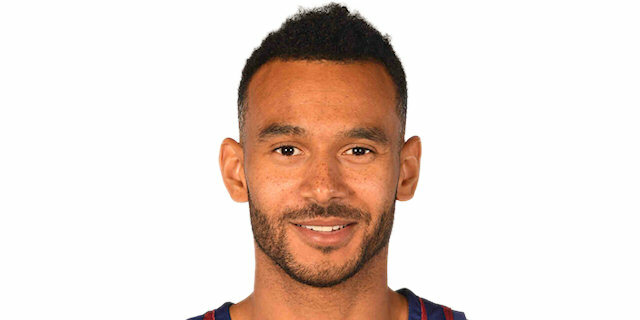 He finally finished a fast break himself, before Pullen split foul shots to end an 8-0 run and make it 23-16 after 10 minutes. 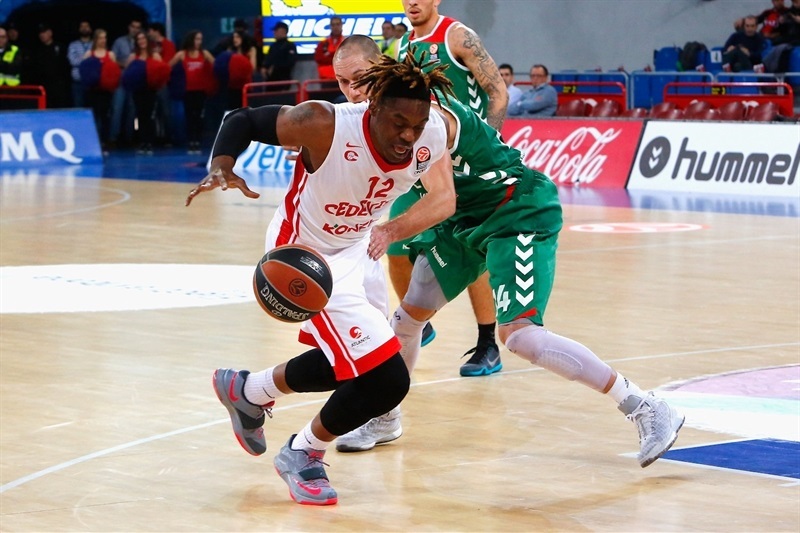 Henry Walker opened the second quarter with a long jumper for Cedevita. After Jaka Blazic and Bilan traded baskets inside, Lovro Mazalin finished a fast break with an alley-oop dunk, getting Cedevita within 25-22. James and Bilan traded baskets before James nailed a jumper and Alberto Corbacho made a tough runner-plus-foul , opening a 32-24 lead. After free throws from Walker, Shengelia buried a wide open triple to open a double-digit margin, 36-26. James added a jumper to the tally, and after Luka Babic went coast-to-coast for a layup, James kicked it out to Shengelia for another triple and that made it 43-28. Ilimane Diop scored inside to extend the margin to 17 points, before Pullen snapped an 18-4 spurt by splitting free throws to set the halftime score at 45-29. Cedevita’s James White hit a corner triple to start the third, but Shengelia hit a pair of shots from downtown to make it 51-32. Marko Arapovic scored inside for the visitors, and after Causeur made an easy two on a breakaway, Arapovic buried a three to cut it to 53-37. 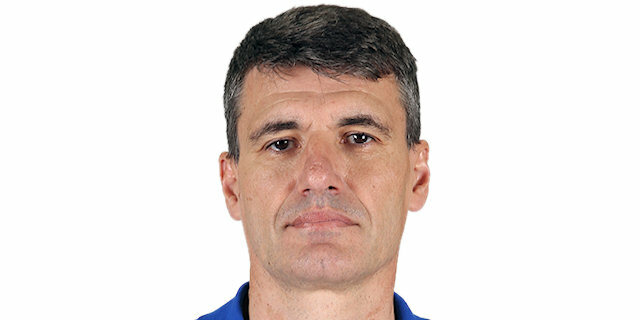 The visitors found some offense, as Gordic drove the length of the court for a layup and Zoric made a jumper, but Laboral got to the free throw line to keep the visitors at bay. Arapovic's three-point play cut it to 57-44, and after Hanga drove for an easy layup, Babic scored a layup-plus-foul to make it a 12-point contest. Babic's fastbreak dunk a minute later got the visitors within 59-49. After a Laboral timeout, White trimmed the deficit with free throws, but Bourousis scored a layup and Causeur hit a long baseline jumper, forcing a Cedevita timeout. Zoric fought for a tip-in, and after Bourusis scored a reverse layup, Gordic beat the buzzer with a jumper to make it 67-57 after three quarters. 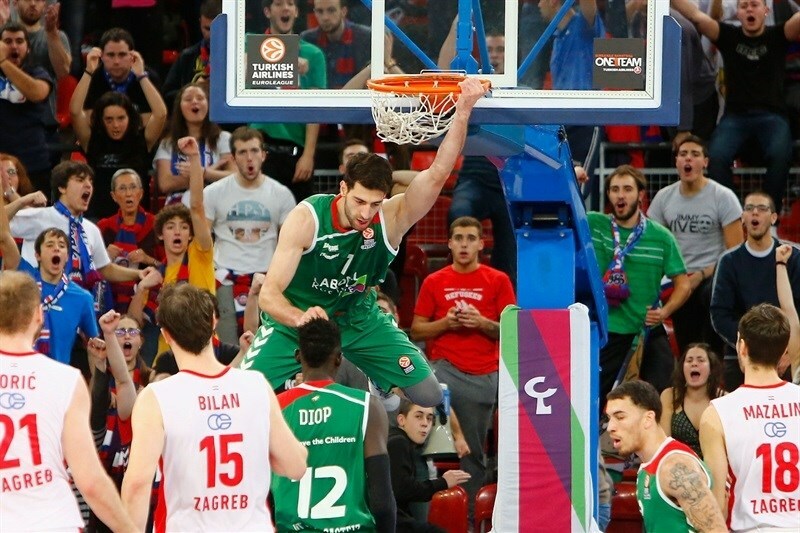 Bourousis finished a fast break with a put-back dunk and Corbacho nailed a triple before Causeur had a fastbreak layup to open a 74-57 margin only 96 seconds into the quarter. Arapovic banked in a runner, before Tillie and Fran Pilepic traded triples. 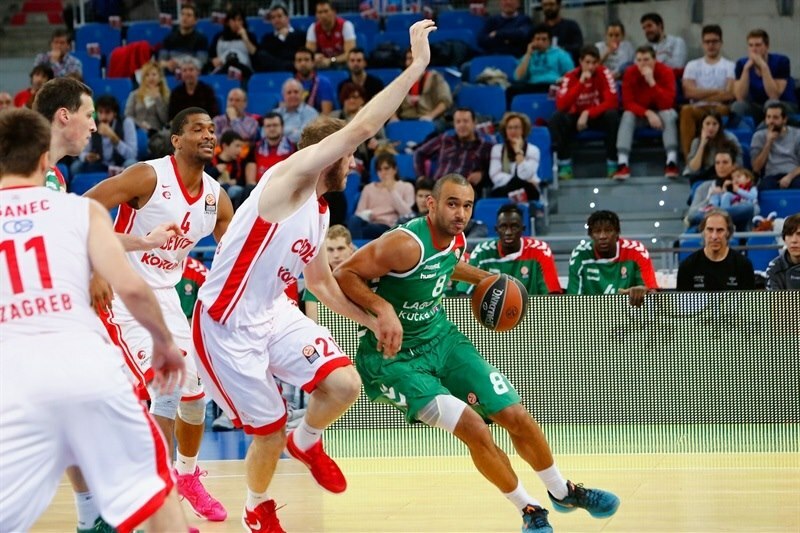 However, Bourousis stepped up, hitting a pair of threes that extended the lead to 83-62. 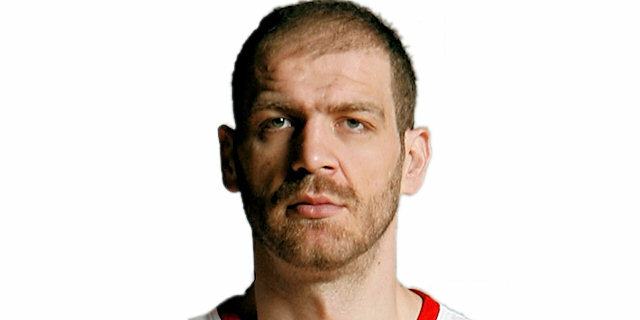 The run continued with Blazic scoring inside, and Shengelia adding an alley-oop dunk. Bilan snapped a 9-2 run from close range, but Corbacho hit a jumper. Bilan scored inside again and Mazalin drove for a layup to round out the scoring. "I think we deserved this win. It was good to finish the regular season with good feelings. I think we completed a solid first stage of the competition, we can feel happy for that. Even when we lost games, we weren't too far from our opponent and we were able to fight face to face and to challenge big teams, quality teams. Tonight's game lacked intensity sometimes, but Cedevita is a very good team that required a lot from us. We showed more will, and we were more accurate tonight. " 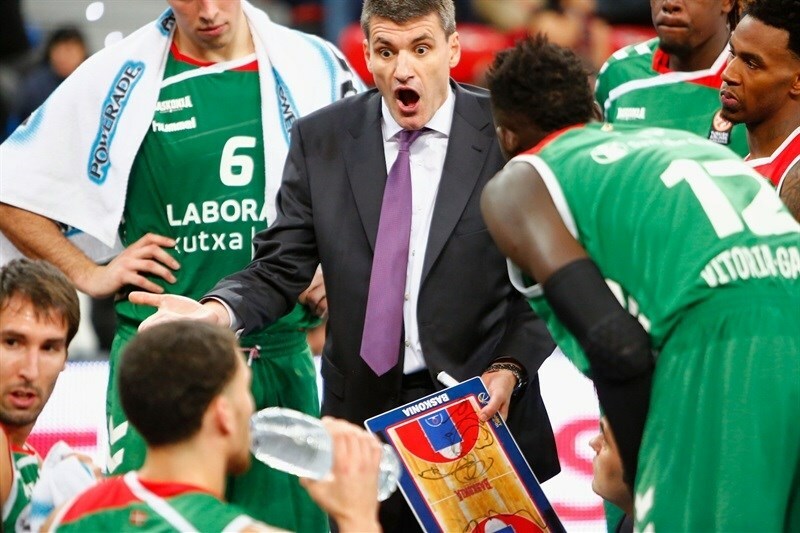 "Laboral Kutxa played much better than us tonight. We turned the ball over too many times, we played with too much haste, especially in the beginning of the game. We ended up using this game to give some playing time to players that didn't have that opportunity in other games, but that also helped us to get here. I hope we will have the opportunity of coming back here in the next stage, playing better, and leaving a better image. We didn't reach the defensive level we needed tonight. 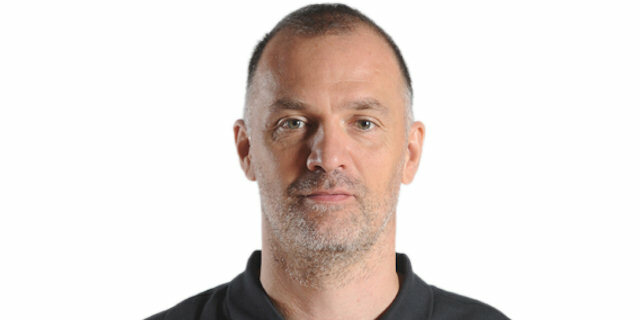 Causeur, in the early going, and Bourousis and Shengelia with several threes, hurt us too much." "I think the most important thing tonight was to break the three-loss streak we had before the game. We finished in a good way the Euroleague Regular Season and this is a win that makes us feel good. I think we played better defense than we did in the last three games. Now we must keep working, there are four games left before the new year and we want to win them all. We know we are a good team when we play together and when we play strong defense. The Top 16 will be tough, for sure, as the best 16 European teams will be there, but we are not thinking too much about that." "We faced this game with a true feeling that we could win here tonight. But we didn't play well, and even though we were able to come within 7, 8 points in the third quarter, we felt short. We need to watch the game to see what happened, but this round is over and now we start from the beginning and we'll see what happens in the next rounds. Expectations are always the same, we are sportsmen and our only target is to win the next game. We want to give our maximum in the Top 16 and hopefully good things will come. I am starting to feel better after some problems in the beginning of the season. I hope to be in better shape as the games go on."